• Increased the multiplier for monthly divisional supply allocation. 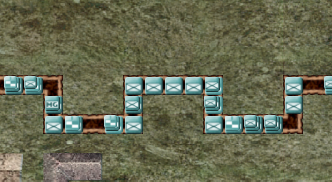 With an increased emphasis on field supply dumps and supply lines, I figured I would make it less of a headache to deal with supplies in general. Let me know if this is a good change - shell shortage was a real thing, after all, and trying to balance realism and gameplay is a constant concern. • Tooltips now show up properly for all unit effects and commander traits. Tooltips weren't showing up properly because each refresh was erasing the entire list and re-creating it with each game tick. Hopefully this makes things a but more clear. • Added tooltips all over the place, notably for unit effects and commander traits. • Many of you have requested a way to tell at a glance how many units are on a tile. I previously said this was tough because, unlike HOI, units would bleed over into neighbouring tiles if they were stacked. I gave it a try and came up with a compromise - the stack caps at three. This way I can simply shrink the units without having them overlap into adjacent tiles, and there's still a rough overview of how many units are on a tile. I hope this helps! • Being under attack is (and always has been) rated by severity ie. being under light machine gun fire is less debilitating than heavy machine gun fire. This was, however, impossible for you guys to know because there was no visual indication of this effect. I've now added it in. • Non-supply units can now carry food. I figured carrying food didn't need specialist supply units, and it helps alleviate the burden placed on supply units in this game. This also means that the Carry Supplies and Supply Area orders are unlocked for all unit types, and they will automatically head to the rear to resupply if they run out. • Rate of wire building has been sped up, to encourage more of it. Dealt with a rather serious issue this update, which is why there is such a quick turnaround. • Fixed issue in which popups would take precedence over subscreens like Headquarters and Order of battle, effectively locking up the game if these subscreens were open when a popup appeared. • The HQ screen was not refreshing properly when reserve units were replaced. This would cause weird issues when attempting to change a unit's type in reserve. • Following on from above, upgrades were not being reflected properly after being loaded from a save game. This has been fixed. • Debug functionality was left over in which using the "Suppress Area" command would give 50,000 Valour points for no reason. I've removed it. Now your men have to die just like everyone else's. • Fixed a crash which would occur if units went on leave while still selected/highlighted. • Added the existing commander stats to the commander reassignment popup, so that you can compare commanders. • Following on from above, old commanders were not being reset to "Unassigned" when replaced, which meant that commanders would gradually disappear from the list of available commanders. This should no longer happen. • Fixed issue in which underground units sent on leave would go through the ground rather than returning to the surface. • Building mines was broken when I added the separate Build Mode. This has now been fixed. 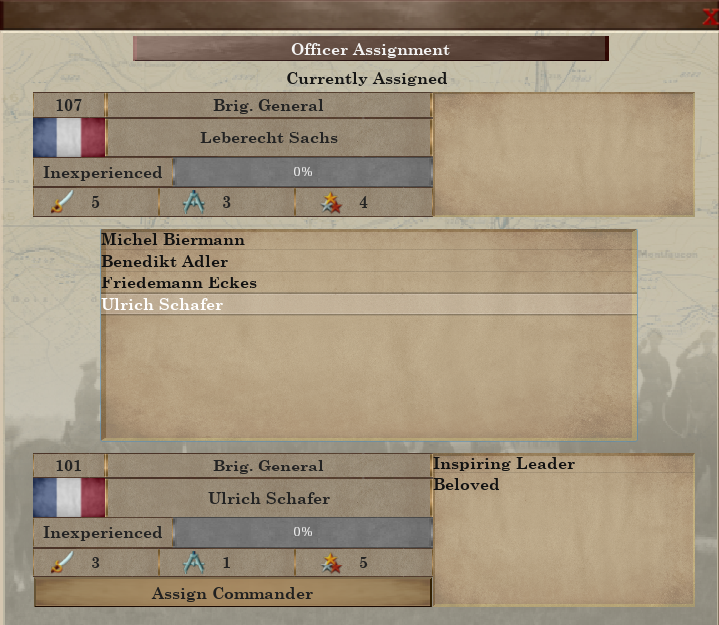 • Commander traits now refresh properly when units move in and out of company command range. • You can now view the status of units in reserve. Selecting the top-level reserve unit in the Headquarters screen will cause a new button to appear. • Front-line units are no longer randomized at the start, allowing platoons to start near their company commanders. This should reduce the amount of initial micromanagement when starting a new game. • Units in reserve now will also treat wounded men. • The target selection list that appeared when using "Attack Unit" was not resizing properly when the name of a target unit was too long, causing the button to bleed out of bounds. This has been fixed for both fonts. • Changed the icon for AOE orders like "Suppress Area" and "Watch Duty" into a different icon, so it's easier to tell when you're actually in one of these modes. • Commander selection used to only show unassigned commanders. Now there it is possible to toggle unassigned commanders or all, allowing you to simply trade officers instead of having to unassign and reassign in two distinct steps. • Pilots now have traits, just like officers. • Pilot balance has been tweaked, so that really good pilots are harder to shoot down, and lower-stat pilots are easier to shoot down. I believe this actually reflects real life a lot better. • Following from above, monthly pilot regeneration rate has been increased to compensate for the fact that you will probably be losing more pilots. • Pilots now have personal stats, like flight time, number of sorties, number of kills, etc. This is all "flavour" for the moment, but provides a solid base with which to flesh out the individuality of pilots. Feel free to suggest anything else that needs to be tracked. 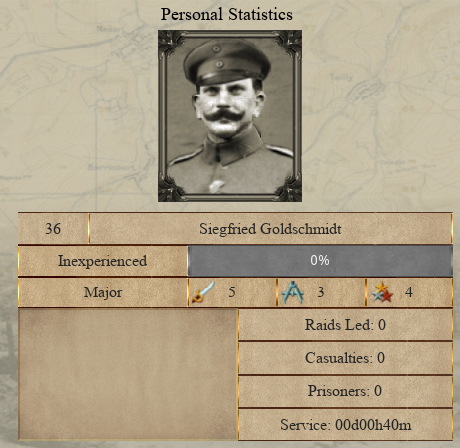 • Officers also have personal stats. They're self-explanatory, except for raids. Company commanders will be given credit for a raid when one of the platoons under their command returns with prisoners in tow. • Pilots now can develop an affinity for a certain model of plane, causing a temporary penalty when changing planes. This penalty is less than the gains you receive from the new plane, but is still something that needs to be taken into account when upgrading. The greater a pilot's affinity for a certain model, the longer the penalty lasts when changing. • I wasn't happy with the rate of wiring that the enemy AI does, as it seemed unrealistically low. Thanks to better optimization of the game in recent weeks, I've been able to tweak the AI so that it lays far more wire than it used to. • Fixed potential crash if units were withdrawn as the enemy AI was attempting to target them for bombardments. • Fixed bug with supply units randomizing their load type instead of keeping the one they originally had if they return to supply depots automatically. • Pilots shot down weren't being properly displayed or tracked, which in turn wasn't updating the number of pilots or planes properly. This should now be fixed. • Supply units could restock gas shells without having either gas upgrade unlocked, but this has been fixed. Most of the work this week was getting forest tiles in the game, which in turn necessitated a re-scaling of buildings. I also had to rewrite the plane upgrade logic into a form that made more sense. Long story short, this update is really more about refining and expanding what's already in the game rather than adding wholesale new features. • Fixed bug in which selected units that were sent on leave would remain selected when they were recalled. • Fixed bug in which enemy AI was too lenient towards retreating units, causing situations in which opposing units would not attack each other even when on the same tile. • Re-tweaked the scale of buildings to be more realistic. I've been working on forest terrain, which really made it clear how messed up the scale of buildings still was. • Tweaked the plane upgrade mechanic. Instead of upgrading each plane individually, each tier of plane is a single upgrade. Your next monthly supply of planes will then be of the newer models. Additionally, replacement pilots will automatically be equipped with the newest model available. • Fixed errors with pilot highlights in Air Activity Screen, whereby units previously selected/highlighted would remain so even when selecting a different pilot. • You can now rename your units. Several of you have asked for this feature to facilitate organization of units. • Bug in which the Order of Battle never properly refreshed the current actions of each unit has been fixed. • Have changed the default manner in which companies and platoons are named. Now their numbers/names are relative to their commanding unit ie. each company will have its own 1st Platoon, etc. • Fixed crash that would occur when scheduling orders if order was issued after its intended start time. • Have separated terrain effects into separate effects depending on terrain type. This allows me to customize things, like having forests impede movement, or buildings obscure units based on their condition. • Morale and readiness regain is now halted when on watch duty. I'm hoping this gives players more of a reason to rotate units between watch duty and rest. • Machine gunners can now explicitly be ordered on watch duty. Previously they could only be ordered to rest, and would switch to guard duty during the day. • Underground pathfinding and actions were broken due to some overzealous optimization on my part. This should now be fixed. • Also due to optimizations and tweaking, there was some weird behaviour where units would cross into enemy trenches before starting to perform actions in no-man's land. This is fixed. • Fixed issue with tutorial dialog in which the title bar wasn't large enough, resulting in situations where you would end up clicking on something behind the popup when trying to move the dialog around. • Support units can now only make use of melee attacks. I know engineer units often carried carbines, but I wanted more distinction between support and combat units. Note that support units can still use melee combat. • Bug in which HQ units would attack opposing units in melee without actually moving to the enemy unit's position has been fixed. • Corrected start time for tutorials when loading them after having played a different map. Previously, they would carry over the time from the previous map. • Crashes when returning to the main menu or starting a new map have been fixed! • Font is now Times New Roman. • If fog of war is enabled, enemy-controlled tiles will now be seen as open ground when clicked on until they are revealed. • Bug in which showing unit attack ranges would reveal hidden tiles when fog of war was enabled has been addressed. • Line of sight has been tweaked so that units can no longer shoot over hills. • Some pathfinding optimizations have taken place, which hopefully makes the game run a bit smoother. • Elevation Map now appears above other ground tiles, making it easier to see the elevation of trenches, etc. • Errors in calculation of total division numbers, morale, supply, and readiness have all been fixed. • Bug with names and alternate names of reserve units disappearing have been fixed. • Default names of units now have proper notation. For instance, 1st Brigade, 2nd Battalion, C Company, 3rd Platoon is now 1/2/C/ 3rd Platoon. • Star shells now decrement properly when used. • Units supplying an area no longer distribute supplies to units outside that area. • Errors that were popping up but not causing crashes in the debugger have been addressed, which will hopefully alleviate many of the crashes being encountered. 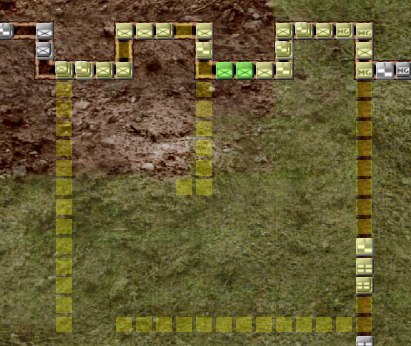 • Fixed some pathfinding issues that would arise with the enemy AI that would cause it to skip building certain tiles. • Fixed bug in which certain situations would cause the enemy AI to get stuck attempting to rotate its units into the reserve, creating unnecessary pathfinding checks that slowed the game down. • Buildings under construction no longer provide protection until complete. • Watch duty is now an option when in terrain (houses/forests). • Machine gun units can now perform watch duty at night. It wasn't particularly realistic to not have machine gunners attempt to attack advancing enemy soldiers at night. • When rifle units attack advancing enemies in no-man's land during daytime, they now specifically target single tiles rather than entire areas. • Support units now cause less damage in melee combat. • Selecting zero tiles in a rest order no longer crashes the game. • Supply Area orders no longer default to the current mouse position as the starting position. This fixes the bug in which ordering a unit to supply an area would result in them moving into no-man's land prior to supplying units in trenches. • Help button is now clickable in the pause menu and allows you to view information about certain aspects of the game. • Blocking issue involving subordinate/superior units in Basic Training tutorial has been fixed and takes into account the newer unit information popup. • Tweaked the enemy AI to be a bit more aggressive in building structures. • Fixed bug in which the enemy AI was not properly rotating its troops to the rear. • Portraits have been added for officers and pilots. • Some typos and grammar issues in the help text have been fixed. • Section about officers has been added to the help text. • Watch Duty is now possible in blockhouses. • Structures built in houses and forests are now partially visible. • Weather conditions now affect artillery. Number of squares hit within an artillery unit's attack range is now reduced in adverse weather conditions. • Artillery now actively avoids tiles which would be unfeasible to stop in, such as dugouts and houses. • Bug in which two-tile sized houses were not properly providing cover over both tiles is now fixed. • Units will no longer be able to stop in tiles if they are over the crowding limit. I'm hoping this addresses some concerns with regard to the feasibility of having hundreds of men crammed into a single tile by forcing players (and the AI) to be a bit more proactive in building comprehensive trench networks. • Units now spread out when building a line of trenches, communication trenches, or barbed wire. This is done to prevent crowding and reduce micromanagement. However, it should be noted that this doesn't apply for single-tile structures like dugouts or field hospitals, nor does it apply for underground structures. • Added a new forest variation. • Bug in which sight was not extending for units in blockhouses has been fixed. • Enemy now starts with some wire pre-built. • Following on, wire effects have been tweaked so that units will be stunned as they cross wire, rather than simply stopping in their tracks. The duration of the stun is longer depending on how heavy the wire is. • Reinforcement of trenches is now a binary attribute ie. a trench tile is either reinforced or it is not. A reinforced trench adds duckboards which reduce the movement penalty in trenches and adds firesteps, which increases the sight range of units on watch duty. 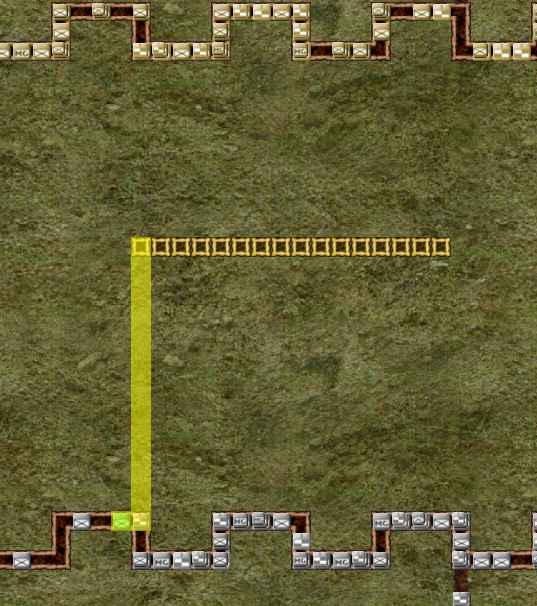 Conversely, the sight range of units is now reduced by a few tiles. Following on from above, the movement speed of units in un-reinforced trenches has been reduced. • Reinforced blockhouses now look different. 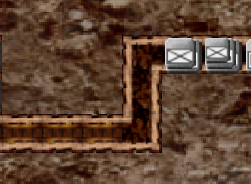 Unlike trenches, there is no gameplay effect on blockhouse reinforcement other than to make the blockhouse more resistant to damage. • Following on from above, the Fortify Blockhouse order now works again. I had broken it with some of the changes I had made previously. • Highlights for paths and areas have been reworked to be less of an assault on the eyes. • Support units no longer participate in group construction actions when selected. • The unit order submenu used to require you to select a group of units that were all the same type. Failure to do so resulted in a truncated order menu with only three orders - Move, Rest, and Cancel. 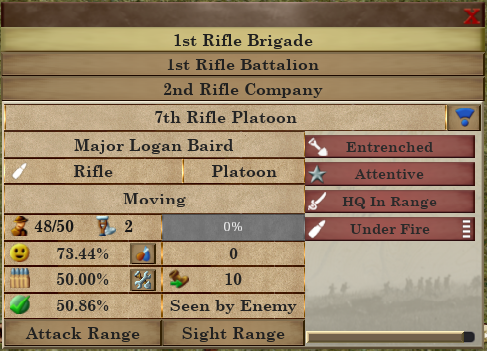 Now you can select units which fall under the same broad category - Combat, Support, or Artillery. That is, you can select a group of rifle units and a few machine gun units and issue an Attack Area order to all of them. Note that ineligible units still will not carry out orders they normally wouldn't be able to. For example, selecting an engineer unit and a supply unit and issuing a Build Trench order would only issue the order to the engineer unit.